CommScan has picked up another unannounced figure heading our way. 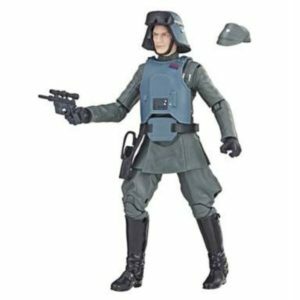 InDemandToys.co.uk has posted an image of a 6” Black Series Exclusive General Veers complete with removable AT-AT Commander armor. Look for an official announcement soon regarding its details. If you listened to our last episode of The Realm Recap, you may have heard a passing mention of this figure. The Realm Recap is back! It’s been many moons since our last show but as we approach the release of The Last Jedi, what better time to review the latest in collecting news. Hangout with Flyguy and me as we discuss Hasbro, Hot Toys, Funko, Hot Wheels and more. It’s good to be back. Join Yakface and Flyguy as we discuss the highlights from SDCC as well as the recent product leaks for The Last Jedi in the lead up to Force Friday 2! Once again, The Realm Recap return this week with the latest in Star Wars collecting. This week, we discuss various reveals and store reports for the Hasbro, as well as new product announcements from Hot Toys, S.H.Figuarts, Kotobukiya and more. Finally, Flyguy and I share our latest acquisitions and reviews since our last show. This and much more on Episode 106 of The Realm Recap.